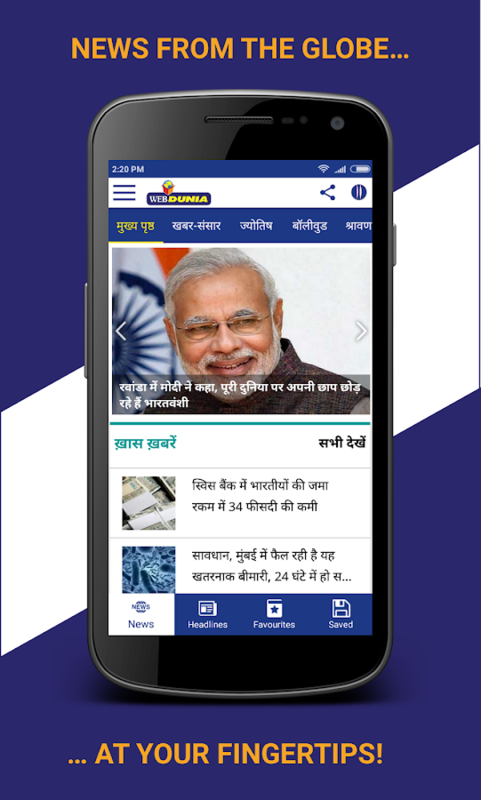 Webdunia.com is pioneer in providing content in Indian languages.Through this app get all the authentic news, views and articles onyour gadget. The app has been designed to be very user friendly andserves the content as you need. Webdunia is available in Hindi,English, Tamil, Telugu, Kannada, Malayalam, Marathi and Gujarati.Please select your language and browse through the rich,entertaining and exclusive content. News, views and other contentis categorized under various topics for your ease of navigation.The Dedicated editorial team of Webdunia ensures that you get thelatest news and happenings on real time basis. The important partis the editorial values that we have created with best journalismpractices over the years. Our Feature content is most exclusive andappealing, be it the religious, astrology, literature, recipe,entertainment or life style related content. With the Webduniaofficial app you can get – • Breaking News, Latest News andHappenings • Views and analysis of news from subject experts • Newsand gossip from films • Religious content with authentic referencefrom mythological documents • Cricket section with Live score cardand real time updates • Jokes and Humor • Stories and knowledge forkids About Webdunia: Launched way back in 1999, Webdunia was thefirst to realize the importance of online, that too, in languages.Launched as first Hindi portal, Webdunia has many firsts to itscredit. We were also the first no font download site and also theearly movers on Unicode. Presently we have portals in 8 Indianlanguages covering North, East, West and South India. Through theseportals, Webdunia is reaching to avid language readers, every day.With 15 years of experience in online content, Webdunia is marchingahead with innovations and excellence. At present we have following8 Portals: 1. Hindi.webdunia.com 2. English.webdunia.com 3.Tamil.webdunia.com 4. Telugu.webdunia.com 5. Marathi.webdunia.com6. Kannada.webdunia.com 7. Malayalam.webdunia.com 8.Gujarati.webdunia.com We welcome your feedback. 582, MG Road, Indore, India. Each one of us comes across days those are better than others orwhen everything is just perfect. Then, there are days when nothingseems right. Would you like to keep a record of your life’s ups anddowns, happy and sad moments? Here comes an exclusive phone dairythat will help log all good and bad experiences incurred in yourday-to-day life. 'Rate Your Life' to see how your weeks, months andyears have been. You can create and maintain journals of your dailyexperiences and rate each event and activity.